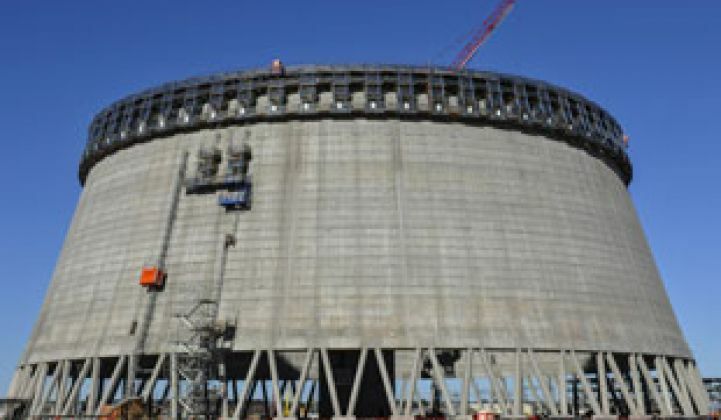 All eyes are on Georgia to see if nuclear can launch a comeback in the U.S.
Energy Secretary Ernest Moniz will travel to Waynesboro, Georgia on Thursday to issue approximately $6.5 billion in loan guarantees for two new nuclear reactors at the Alvin W. Vogtle Electric Generating Plant. The reactors will be the first new nuclear facilities constructed in the U.S. in about three decades. The terms of the loan agreement were tentatively offered to Southern Company in 2010, but low natural gas prices, the Fukushima nuclear meltdown and a lack of a federal carbon policy have hampered nuclear power. The loan guarantee was also sidelined by Solyndra's bankruptcy, which rattled the DOE loan program. Since becoming the head of the U.S. Department of Energy, Moniz has repeatedly talked about small modular reactors, pointing to their benefits in terms of cost and security. Last year, the DOE issued about $250 million to fund the demonstration of the technology. But the loan guarantee just issued is for more traditional nuclear technology: it will fund a pair of 1,100-megawatt Westinghouse AP1000 nuclear reactors. The total project will cost more than $14 billion, according to Reuters. Georgia Power, which is part of Southern Company, owns nearly half the plant. Oglethorpe Power Corporation (OPC) has a 30 percent share, the Municipal Electric Authority of Georgia owns 22.7 percent, and the City of Dalton, Georgia owns just over 1 percent. The loan guarantee is split between Georgia Power ($3.46 billion) and OPC ($3.05 billion) with a separate outstanding loan guarantee for $1.8 billion that the DOE has until the end of July to finalize. “The construction of new nuclear power facilities like this one -- which will provide carbon-free electricity to well over a million American energy consumers -- is not only a major milestone in the administration’s commitment to jumpstart the U.S. nuclear power industry, it is also an important part of our all-of-the-above approach to American energy as we move toward a low-carbon energy future,” Secretary Moniz said in a statement. Despite Moniz's hearty endorsement of the project, the DOE is just testing the waters. At one point, the DOE loan program was looking at about $50 billion in loans for nuclear. Many will be watching the Vogtle project for cost overruns and delays, which have already plagued the project. However, Westinghouse claims the AP1000 is the most economic nuclear power plant available worldwide because of its simplified design. But some environmentalists are already questioning whether the project can come in on time and on schedule. At the same time, other nuclear power plants are closing. San Onofre Nuclear Generating Station in Southern California was taken offline two years ago after radioactive leaks were detected. The plant will not reopen. Other nuclear facilities, like Vermont’s Yankee nuclear power plant, will also close later this year. In Southern California, the closing of SONGS has opened the door for more energy efficiency and renewable energy to meet the capacity loss. In the Midwest, closing coal plants have also largely been replaced by transmission upgrades, energy efficiency and renewables. In the case of the Yankee plant and others, nuclear facilities are simply losing out to low-cost natural gas in energy markets. Additionally, any nuclear plants that are reaching the end of their lifespan will either have to undergo expensive upgrades or be retired in the next ten to fifteen years. The two new reactors are expected to come on-line in 2017 and 2018.